Join Us!!! We are looking for someone to help us cover Cayman Islands basketball. Please send us an e-mail. 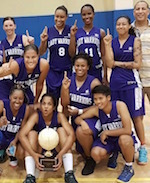 The Lady Warriors are the queens of Cayman Islands basketball for again, beating Women of Valor 61-52 on Sunday, 11 June, to win their third straight championship. Courtisha Ebanks (F) led the way for Lady Warriors with 26 points, 13 rebounds, four assists, a steal and a block to be named the finals MVP. Hannah Parchment added 20 points. Up 27-20 at the half at the Clifton Hunter High School gym, the Lady Warriors were fueled by the energy of Ebanks and Parchment, with the pair constantly driving to the paint and shooting well from mid-range. They were tested in the third quarter when Women of Valor pressed, led by Chloe Ebanks (19 points). Women of Valor took a 36-36 lead in with three minutes left in the period when Rochel Gardener hit the go-ahead layup. A keen battle ensued in the fourth quarter, as neither side was able to get much separation on the scoreboard until Stacy-Ann Kelly completed a three-point play with 1:54 remaining in the game to give Lady Warriors a 54-51 advantage. She finished with 10 points. A straightway three from Parchment with 1:07 left made it a seven-point game and at that point it was all academic as the two-time defending champions got set to hoist their third trophy in as many years and sixth overall. 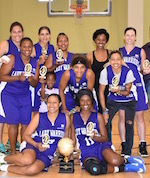 'It's exhilarating,' said captain Dionne Anglin (C). 'It's one of the best feelings in the world because we've come very far.' She was heartened by the fight her team showed after giving up the lead in the third quarter. 'We usually don't play well on the rebound, so we had to slow the game down, catch ourselves, build back our momentum and get back into the game. Slowing down the game is what really counted.' It was a special feeling for the MVP Ebanks. 'It always feels good to come up big, especially when your team relies on you a lot.' She was also full of praise for the veteran players. 'It means a lot because we have a lot of 'old foots'. For them to dig deep with us, it means a lot.' Collin Anglin, who was named Coach of the Year, said he was proud of his Lady Warriors. 'You always want a finals like this. It wasn't just a blowout or an easy win,' he said, acknowledging that the Women of Valor team also played like champions. 'We weren't given the championship. We had to earn it. So, I'm very proud of the ladies. They went down - that's when your mental toughness is tested - and we came back,' he said. No one saw it coming. Everyone knows that building a team takes time, especially when most of your players are new to the sport. This was the Islanders in 2016. They went through the 2016 season without a win, but established themselves as a 'take no prisoners', rough and tough team. There was one critical ingredient that the team was missing..EXPERIENCE. However, this year came as a shock to the other opponents who expected to pretty much the same team. But when the defending Champions - Lady Warriors - saw some veterans step onto the court for the Islanders, their smiles disappeared quickly! And for good reason. By the time the smoke cleared, the defending champions found themselves in shock; losing to the Islanders 42-33. With the addition of players like Jennifer Cotarelo-Choice (G), Renee Thompson (C), Scimone Campbell (G), Krystle Barrett (G) and Christsania Parker (F), the Islanders are now a force to be reckoned with.